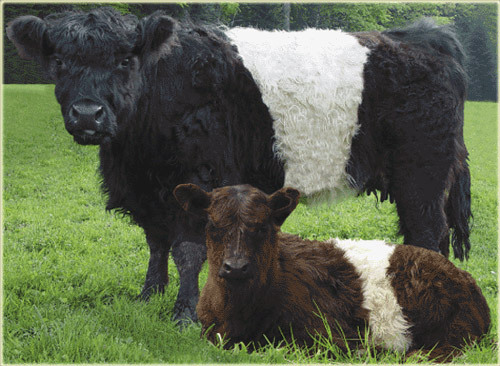 The Galloway breed is small to medium framed. The hair is long, soft and wavy with a thick undercoat. The most common color is black, and there are also yellowish-gray to light brown animals. New-born calves are mahogany brown. The head is short and broad, the ears are of medium length and wide, and are fringed with long hair. The neck is of medium length, the shoulders are angular and high; the brisket is full and deep. Polled. Undemanding with respect to feed and care. Hardy. Quiet temperament, placid and obedient. Suited to crossing with other breeds, traditionally with the Shorthorn. Good-quality meat, tender and well marbled.